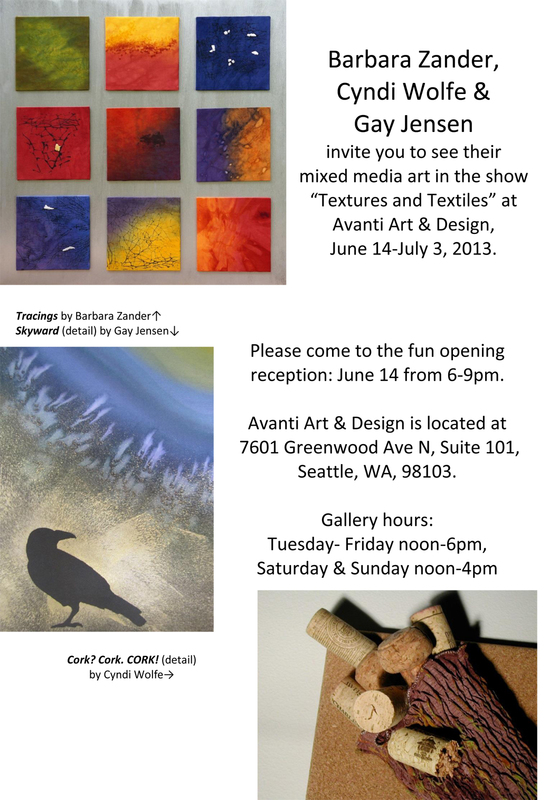 “Textures & Textiles”, a multi media show exploring the uses of texture and/or textiles opens June 14th at Avanti Art & Design in the Greenwood neighborhood. SDA Members including Gay Jensen, Barb Zander and Cyndi Wolfe are participating in this show. Please come to the opening reception on June 14th from 6 – 9 pm and support your fellow SDA members. The show will hang from June 14th through July 3rd. Avanti Art and Design is located at 7601 Greenwood Ave. N, Suite 101, Seattle Washington. Click HERE for a map. In addition to the opening, the gallery is open Tuesday through Friday from noon to 6 pm or Saturday through Sunday from noon to 4 pm. This entry was posted in Exhibition and tagged Avanti Art & Design, Barb Zander, Cyndi Wolfe, Gay Jensen. ← Dancing Surfaces Show and Juror’s Award is Announced!